Vraisemblablement Votre Veloclub: Ep(ping)ic Loop! This morning at 8 a.m., two members of the TroisV met for a training ride in preparation for the Tour of Wessex. We met not at the TroisV Meeting Point, but at the Drum and Monkey (the pub wasn't open yet; we didn't start with a pint), and rode Epping Loop, with a few inadvertent alterations. 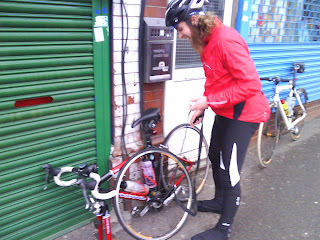 In Walthamstow we dealt with a flat, but it was smooth, if hilly, riding thereafter. Somewhere along the line we passed the same guy twice within about ten or so minutes, which was confusing and made us feel like we were stuck in the Twilight Zone. Around the halfway mark we encountered one of our enemies (Team Cinzano! ), and Matt yelled, "Cutters!" 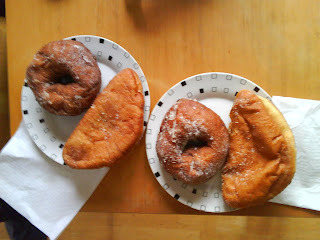 Upon our return to Archway we stopped at the bakery and went to my house for coffee and doughnuts. We also decided that the next club ride will be a leisure ride involving coffee and cake, somewhere within the confines of London. Two songs! One for the title, one for the doughnuts. TroisV!